Address : Suravaram village, Srikakulam district, AP-532427. 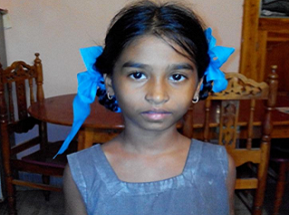 Vanaja lives with her grandmother whose only source of income is old age pension. Vanaja’s parents moved to town for daily wage work since they couldn’t find any work in their village. A ten minute interaction with her shows that she is very active and intelligent. Earlier she did her schooling in Vishakhapatnam but later moved to village due to financial crises.